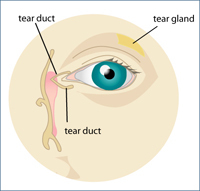 Dry eye is a very common problem that results from either decreased tear production, or tears being produced that are of poor quality and evaporate from your eyes too quickly. There are many possible causes of dry eye, including age, allergies, heating systems, hormone changes, poor diet, health problems such as diabetes, arthritis, lupus, thyroid disorders, and rosacea, computer use, contact lens use, or a history of LASIK. There are also medications that can cause dryness, including antihistamines, decongestants, acne medications, diuretics, some blood pressure medications, and antidepressants. People with dry eye may experience blurred or fluctuating vision, sensitivity to light, stinging, dryness, burning, gritty feeling, or a sensation that something is in their eye. The irritation can also cause your eyes to create reflex tears, leading to watery eyes. Treatments for mild dry eye include artificial tears and lubricating ointments at night, and daily eyelid hygiene. More serious cases of dry eye may require steroid eye drops and medications such as Restasis that increase tear productions. All patients with dry eye can benefit from nutritional supplements like Omega-3 fatty acids, and fish or flaxseed oil. Some patients also have plugs inserted into their tear drainage system to keep tears from draining.